Did you put a vectorial muon current just for simplicity, but it could be left-handed? That is interesting. It is amazing that std model makes all these predictions. I guess these experiments are also testing the "renormalizable" assumption of the std model. Yes, the left-handed muon current would also work (just slightly worse than the vectorial one according to 1411.3161). "These are of course simple models created ad-hoc. Attempts to put these particles in a bigger picture of physics beyond the standard model have not been very convincing so far, which may be one reason why the anomalies are viewed a bit skeptically"
These kind of statements are arrogantly funny. May be in your thinking Fermi should have not published his model before getting the full Standard Model? 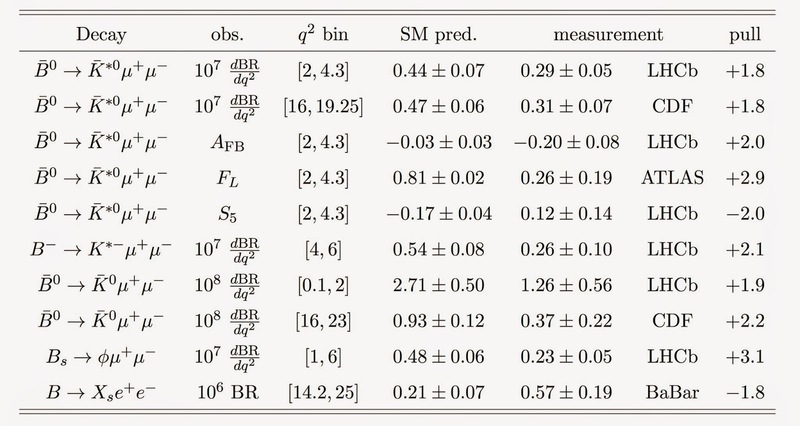 Given the across the board pull of excessively high B to Kaon-mu-mubar events by about two SDs, one wonders if there isn't just some systemic error across the board at LHCb and CDF, for example, in a trigger threshold that underreports electron pairs and hence makes the cross section of muon pairs look higher than it should be comparison, or something in the event analysis code that misdescribes high energy electrons as muons because the data for B decays is outside of the realm of applicability that the code was designed for. Alternately, perhaps D to Kaon-mu-mubars are being miscoded as B to Kaon-mu-mubars somehow and inflating the B source cross section. One could also imagine that the theoretical prediction is light because it incorrectly omitted loop diagrams that one would naively expect to be immaterial, that actually work out to contribute almost as much to the total cross section as the diagrams that were included in the SM estimate. For example, b->-c->s with two W boson decays is one way to get from a B meson to a Kaon, but b->u->s and b->t->s paths are also possible and might have been neglected yet contribute more to the final cross-section than expected (e.g. due to a failure to consider virtual particle paths). BSM theory would be interesting, but a long and hard look for potential sources of error in either the theoretical expectation or the experimental measurement, or both, should still be to preferred resolution if at all possible. The cool stuff is always at about 2 or 3 sigma. Clearly, the way to make physics more fun and exciting is just to redefine "discovery" from 5 sigma to 2! New physics for everybody!